Larry – Copperopolis, CA | Bull Terrier Rescue, Inc.
Not Curly nor Moe but Larry! 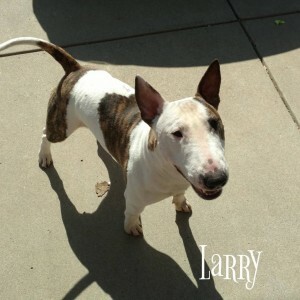 Larry and the other male Bull Terrier in the family are getting into dominance related scuffles. This goofy and active guy is about 2 years old; and he’s great with children, female dogs, and the resident cat (they love playing together!). His family is in 4H so Larry also has been good with chickens and livestock. This 55lb guy is house, leash and crate trained. He is a world-class cuddled! His situation is urgent as the other male (his father) recently broke out his crate and went after poor Larry. An interim spot is being sought while we check out some potential homes. If your information is not yet on file, please complete our online application (http://www.bullterrierrescue.org/?page_id=572).